What can you find in a department store? Who controls the traffic system in the city? How do lampposts light up the streets? 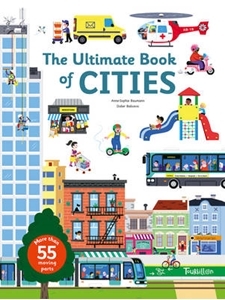 The Ultimate Book of Cities reveals the answers to these questions and much, much more in an oversized fact- and action-packed look at life in the big city! Featuring 55 flaps, pop-ups, pull tabs and movable parts, this all-you-need-to-know guide provides detailed information about what makes a city tick: from the different ways of getting around and what goes on in all the big buildings, to what traffic signs mean and who are all the people who keep the city in tip-top shape! It is a must-have volume to add to a young reader's library of The Ultimate Book series.